connected with prospects upon opening an email? What are some reasons it's easier to grow your business with Infusionsoft and LGM? "The best part for me is being able to track what my clients are doing in real-time. I have made several sales to clients whom I would have never thought to call that particular day." 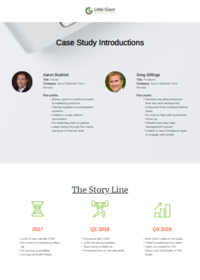 "While everything is automated, Infusionsoft is very thorough in its continued marketing and drip campaigns behind the scenes. We have received more real-time feedback from prospective clients with Infusionsoft than we ever have in SIMS." "It has made the follow up process significantly easier to track and stay in front of customers on a regular basis. Also has allowed us to incorporate tactics to increase referrals and build our presence online." Do you feel that LGM and Infusionsoft changed your daily activity for the better? "Yes, it has completely overhauled our prospecting follow up as well as new business follow up increasing NPS and online reviews (Which drives more online traffic to us)." "Nothing is more true than the saying “The fortune is in the follow-up”. While I maintain excellent follow up on the phones I love the fact that this automated system keeps me top of mind of all my clients and non-clients via email. I also like to see who has been engaged in opening my emails or clicking links in the emails and target them for phone calls." "It supplements our outbound sales process. It allows a prospect to let us know how they would like to communicate. 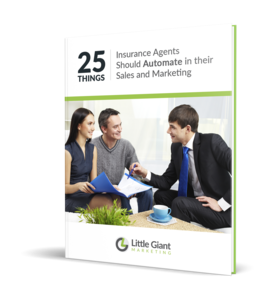 Lead scoring and the ability to strategically stay in front of a prospect are also huge success factors"
We created LGM around a very simple idea: Agents should be able to scale their business as quickly as possible from cost effective marketing strategies. Your dedicated marketing team is here!